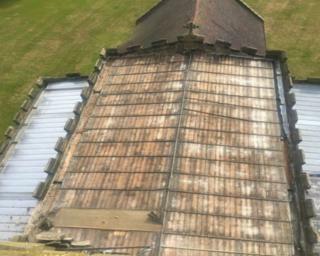 A village church has had £50,000 worth of lead stripped from its roof by thieves. St Peter's Church in Swepstone, Leicestershire, was targeted some time between Sunday evening and Monday morning. Canon Vivien Elphick said everyone felt "gutted" as they had recently raised £25,000 for general repairs to the church. A spokeswoman for Leicestershire Police said they were investigating. The theft was discovered by builders who turned up to work on repairs to stonework at the church. Canon Elphick said: "We just feel gutted in a sense. "We have just spent £25,000 on the building and we now have to get a load more to pay for this. "Fortunately we already had builders on site who have put sheeting over the roof otherwise rain would be going into the building right now."